What Is Inflation and How Does One Measure It? To understand inflation, one must first understand what money is and how to measure it. Please read What is Money and How Does One Measure It? before attempting to understand what follows. Unfortunately there is no general agreement as to the definition of inflation. Here are some of the widely used definitions as noted in Inflation: What the heck is it? Four of those definitions refer to money supply. That brings up another issue. When one refers to "money supply" are they talking about M1, M2, MZM, Money AMS (Austrian Money Supply), or simply the amount of money they have in their bank account or wallet at the time of the conversation? Definitions 5 and 6 refer to "rising prices" yet fail to distinguish between consumer prices, producer prices, or simply prices in general. It seems we could easily add a lot more definitions. Furthermore, some people make no distinction between money and credit but others do as noted by choices 5 thru 8. Still others insist than in the fiat world we are in, the web is so tangled between money and credit that this mess is not even worth bothering to figure out. Those folks simply hold gold and wait for "The Crash". However, it is simply impossible to have a debate about inflation (or anything else) unless the parties can agree on a definition. Like it or not, we live in a fiat world. Therefore we must attempt to have sound definitions that best describe the fiat world we are in. The definition I adhere to is: Inflation is a net expansion of money supply and credit, where credit is marked to market. 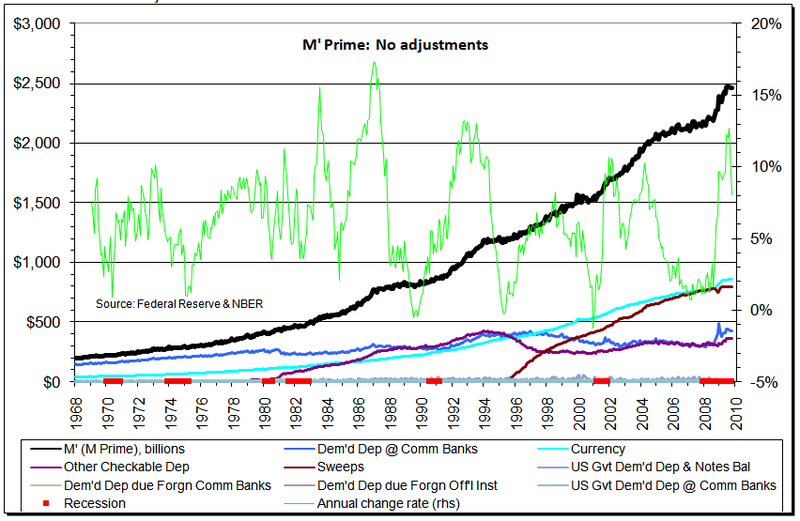 Deflation is the opposite: a net contraction of money supply and credit, where credit is marked to market. The most common definition of inflation is rising prices. Moreover that is the definition central bankers want you to believe. That definition allows central bankers to print money at will, generally inflating prices everywhere (until asset prices crash as they just did), all the while proclaiming they are "inflation fighters". Austrian economists see things differently. They understand that rising prices are a possible "result" of inflation, not a measure of it. While all Austrian economists would agree with that statement most I believe would ignore credit and simply state that inflation is an expansion of money supply (again with many different interpretations of what "money" is, even amongst Austrian economists). While I am sympathetic to the theoretical notion that inflation is an expansion of money supply, such a definition leads to impractical results. Take the idealized case of a country on a gold standard. The true amount of money is the measure of gold. However, prices can soar if more credit is extended on the gold than there is physical gold. This happened in spades in the prelude to the great depression (and many other credit bubbles as well, all of which ended in deflation). Prices can also soar or collapse for other reasons such as a change in time preference (the desire to hold money vs. spend it), shortages caused by crop failures, rising productivity, new deposits (or lack thereof) of natural resources, and what other central bankers are doing in regards to printing money. It is complete silliness to think the Fed is in control of (or can even properly measure) prices, especially asset prices. The Fed ignored asset bubbles twice recently with disastrous consequences. Yet, there is no good way to judge why stock prices are rising. Stock prices can rise as as a result of increasing productivity, falling or rising commodity prices, or simply because of central bank printing. It is virtually impossible to measure why prices are what they are and the "why" is what is important. Thus a focus on prices is misguided. The 1957 Merriam Webster definition of inflation was "An Increase in money supply and credit". The definition now found in the Merriam Webster online dictionary puts the cart before the horse, but it at least still has the cart and the horse in the definition. Most commonly used definitions don't. It is by design of the Fed and bankers that the definition has morphed into common usage to something that removes the Fed from its role in causing inflation. I believe it safe to say that Austrian economists in general would agree that the cause of the great depression was the massive runup in credit that preceded it. Of course the policies of the Fed and Government in attempting to fight deflation made matters much worse. Clearly then, credit has a role in the boom, and credit had a role in the bust, so one must take credit into consideration. Making matters worse, in a fractional reserve system, it can be very difficult to distinguish between what is credit and what is money. The prime example of this is the debate as to whether savings accounts are a measure of credit or money. A strong theoretical case can be made that in a credit-based fiat regime that the proper measure of money is simply base money supply and that everything else is credit. Indeed, as I have pointed out most "money" in checking accounts is not really there at at. It has been lent out, redeposited, and lent out again. In other words it is imaginary. 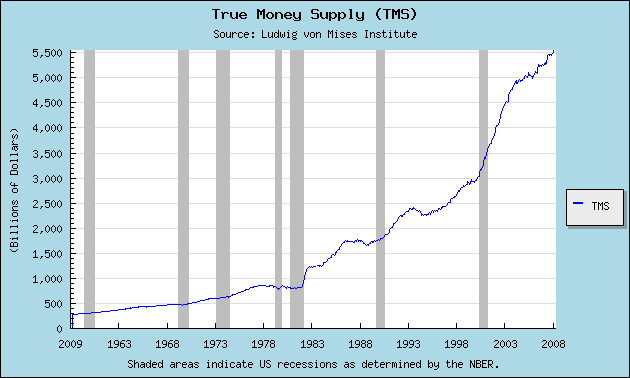 Let's take another look at three measures of money supply. The above three charts depict "money", each with their proponents. There is also M1, M2, MZM, and M3, also with their proponents. Those measuring money as Money AMS or M Prime would have money supply at something like $2,500 Billion. Those sticking with TMS would come up with money supply at $5,500 billion. While base money supply is $1,800 billion. That is quite a difference. The TMS explanation on Mises says "The True Money Supply (TMS) was formulated by Murray Rothbard and represents the amount of money in the economy that is available for immediate use in exchange." The above statement is false. If everyone were to go and withdraw money tomorrow there would be a massive systemic crash and bank failures because the money simply isn't there. The deposits are imaginary. In recent years, more and more economists have begun to include time deposits in banks in their definition of the money supply. For a time deposit is also convertible into money at par on demand, and is therefore worthy of the status of money. Opponents argue (1) that a bank may legally require a thirty-day wait before redeeming the deposit in cash, and therefore the deposit is not strictly convertible on demand, and (2) that a time deposit is not a true means of payment, because it is not easily transferred: a check cannot be written on it, and the owner must present his passbook to make a withdrawal. Yet, these are unimportant considerations. For, in reality, the thirty-day notice is a dead letter; it is practically never imposed, and, if it were, there would undoubtedly be a prompt and devastating run on the bank. Everyone acts as if his time deposits were redeemable on demand, and the banks pay out their deposits in the same way they redeem demand deposits. The necessity for personal withdrawal is merely a technicality; it may take a little longer to go down to the bank and withdraw the cash than to pay by check, but the essence of the process is the same. In both cases, a deposit at the bank is the source of monetary payment. TMS adds in savings accounts because they "act" as if the money is there available on demand, even if it is not. However Shostak does not add in savings accounts for precisely the same reason. I side with Shostak. The irony is that most of those claiming to only count money and not credit in their definitions are doing anything but. Moreover, even Shostak's Money AMS or M Prime includes the results of credit transactions because money from checking accounts has been swept into savings accounts and lent out. (See the discussion of sweeps in What is Money and How Does One Measure It?). The fact that savings deposits have no reserve requirements at all makes matters even worse. As long as one is embarking down a "practical path" one may as well have a completely practical model. My practical model as defined in Fiat World Mathematical Model says that credit and credit marked to market dramatically effect the way the economy works. In a fiat world, money is printed into existence by the central bank - in the United States the Fed. Given there is nothing backing up this money, it is inherently worthless. However, one can think of as real. It was printed (even if only electronically), therefore it exists. In addition to the previously mentioned money supply, fractional reserve lending allows credit to be extended by banks and financial institutions on top of that inherently worthless money. Indeed, banks and financial institutions have leveraged credit to base money at ratios of 30-1, 50-1 or even higher. It's pretty amazing if you think about it: Credit is extended with 30-50 times leverage on inherently worthless paper. It's a faith based system in which banks extend loans and hold the credit on the books (or in many cases off the books in various structured instruments). The banks are thought of as being well capitalized as long as the value of credit on the books in relation to their reserves meets some ridiculously low minimum set by the Fed. This is how the system works, using the term "works" loosely. The day of reckoning comes when asset prices start falling, defaults soar, and the value of credit on the books starts plunging. That day of reckoning has arrived. And if leverage is high enough, as it was with Bear Stearns and Lehman, the institutions are wiped out overnight. Citigroup (C), Bank of America (BAC), Fannie Mae (FNM), Freddie Mac (FRE) and AIG are essentially in the same position of Lehman except the taxpayers via the Treasury are funding the bailouts. Practically speaking, the process of wiping out that credit (or even marking that credit to market) has a profound affect on the way asset prices react, the way corporate bond yields react, and the way treasury yields react. Practically speaking we are in deflation by many measures of credit, as well as symptoms such as treasury yields, falling home prices, the CPI, rents, credit card rates and usage, etc, while those looking only at Money TMS (or even money AMS) say we are not in deflation and never will be. Money AMS (which M Prime tries to mimic) may be a good measure of "Monetary Inflation", with True Money Supply (TMS) is a fair second-best choice. However, neither properly accounts for the real world effect of what happens to the economy when bank lending and credit falls off the cliff. This "recovery" we have seen is based on a mirage, that the debts on the books of banks is not as bad off as everyone thought. 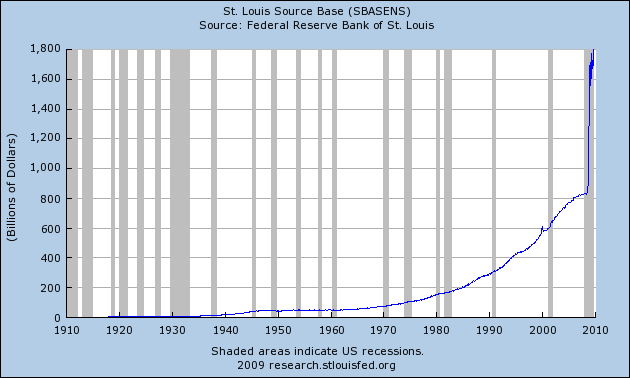 This is what happens when a Fed and Congress throw $trillions around in bailouts and various stimulus plans. Did the Fed stimulus temporarily produce inflation causing marked to marked credit on lenders books rise? Yes that is possible, perhaps even likely given the reaction to the stock market. However, given that true mark to market accounting is not taking place and banks and lenders are playing shell games with the Fed and investors, it is not possible to know. What we do know is that banks are not lending. 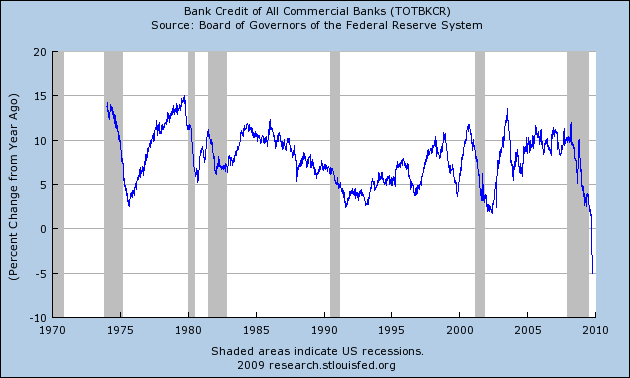 Total bank credit is in uncharted territory at -5%. The series has never gone below 0 before. 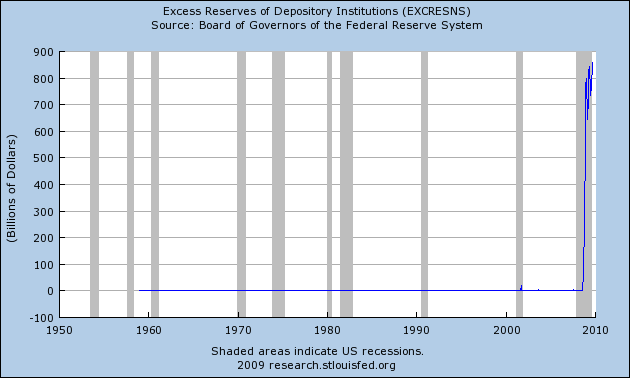 We can also see excess reserves piling up at banks. The Fed has printed but the money is just sitting there. Is that inflation? Please consider this audio with Austrian Economist Frank Shostak on Mises on September 30, 2008 discussing recent actions by the Fed. Will this printing create [price] inflation? This is dependent very much on what money will do next. If banks will not lend and banks sit on that cash forever and ever like the great depression because the risk is too high and the banks do not know if the lending will end up in good assets or bad assets, and because banks are in so many bad assets now they probably will not lend at all. That is the observation that Murray Rothbard made, that during the Great Depression that banks have chosen not to lend because the risk of accumulating bad assets was far to high. So they were sitting on massive reserves. That is what is developing right now. A good example is what happened in Japan in 2001-2002 where the Bank of Japan pumped 300% at one stage and lending continued to collapse. I expect similar things to happen here. If lending will not increase we can conclude this will not be inflationary. 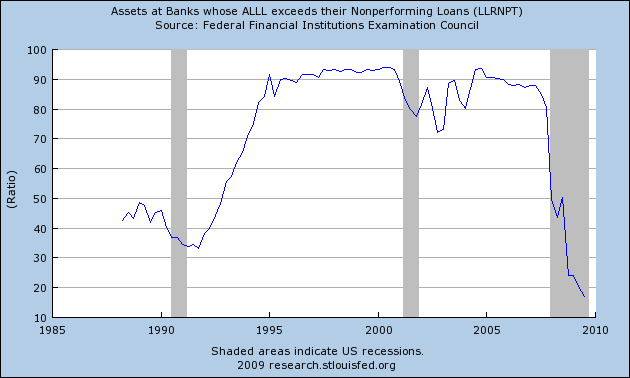 Inquiring minds might be asking "Why Aren't Banks Lending?" 1) There are no credit-worthy businesses that want to borrow. 2) Consumers are tapped out and do not want to borrow. 3) Banks are scared to death of pending commercial real estate losses, credit card losses, residential real estate losses, home equity lines of credit losses, and losses in general. Number three above is the most critical one. Banks need those reserves to cover future writeoffs. ALLL stands for allowances for loan and lease losses. Because provisions for loan losses are a direct hit to earnings, and because allowances are at ridiculously low levels, bank earnings have been wildly over-stated. That is one indication of optimistic forward earnings. Another indication of optimistic forward earnings is that banks have not yet gone to a mark-to-market model on assets. Factor both together and financial earning estimates are wildly optimist. Not only are forward earnings estimates ridiculous, future writeoffs are poised to soar. It is important to understand that all of us are attempting to model our own interpretations of how to apply an Austrian economic model in a fiat credit-based world. Measuring inflation solely by Money AMS or True Money supply while ignoring credit even though both measures contain credit transactions is attempting to put a square peg into a round hole. As a practical matter, I could see a deflationary credit bust coming and called for all time record low yields in treasuries on January 20, 2008 in Time To Short Treasuries? Kass: The bond market is in a bubble that is reminiscent of (and quite possibly as extreme as) other bubbles during previous eras. From my perch, the only issue is the timing of this trade. Mish: Timing is indeed everything and perhaps there is a temporary selloff. But the primary trend is for lower yields. Perhaps much lower yields. There is no bubble in bonds. Not yet. Those who want to see how low treasury yields can get and stay there, need to look at Japan. Yields in the US are going to go far lower and stay lower longer than nearly everyone thinks. Right near the tip top of the commodity bubble on June 26, 2008 when everyone thought yields were going to the moon and the dollar would crash I asked: Is The Inflation Scare Over Yet? It is quite possible the lows in treasury yields are in. Unlike 2008 where I was constantly beating the drums for lower yields, 2009 could be different. Well 2009 was different and the reason is the massive amount of stimulus. However, that stimulus has not produced any meaningful results as can be seen by jobs and by bank lending. As a practical matter this looks like the false bounce in Spring of 1930. Assuming we can all agree that the US was in deflation in the 1930's, then let's discuss the conditions at the time as well as what happened to cause those conditions. Most know my definitions by now but here they are again for convenience. Inflation is a net increase in money supply and credit. Deflation is a net decrease in money supply and credit. In both cases credit must be marked to market to make any practical sense out of what is happening. Those who focus solely on money supply cannot easily explain stock markets that have fallen in half (this does not happen in disinflation), TIPs yields, a global race to ZIRP, or many other events that are happening. Unfortunately there are many definitions of inflation and deflation strewn about. 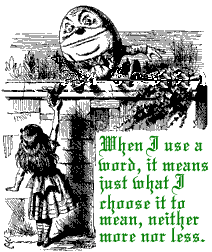 Some play the role of Humpty Dumpty changing meanings at whim, switching from commodity prices, to consumer prices, to expansion of base money or M3 or whatever measure of money seems to be expanding at the fastest rate. Some do the inflationista two-step to avoid admitting that we are indeed in deflation, choosing instead to call it "disinflation"
In short: "We are going to have a period of deflation that we will instead call disinflation." 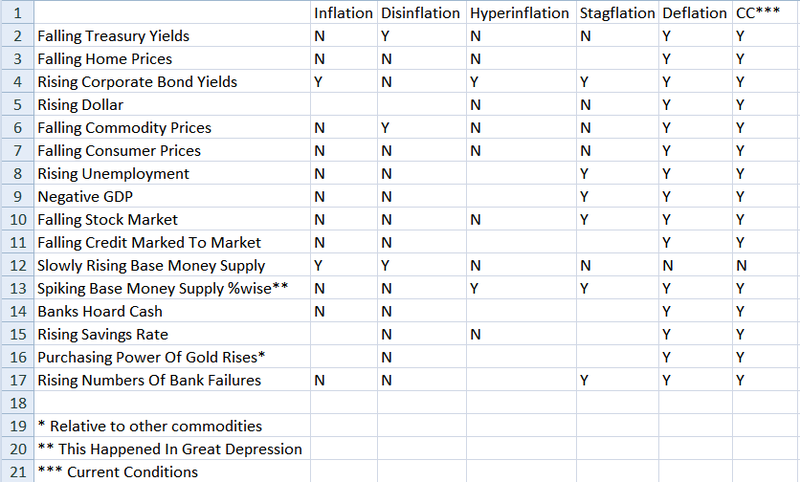 A Practical Look At "Flation"
Here is a table of conditions and whether or not one would expect to see those conditions in inflation, deflation, stagflation, hyperinflation, and disinflation. Some expectations are debatable so I left those blank. That chart is from December 11, 2008 thus some may disagree with where a few of the marks are. Still others might suggest that treasury yields are now rising and the bottom in treasury yields is in. Certainly at 0% the short end of the curve has bottomed, and perhaps the long end has too. However, as a practical matter, the 10-year treasury yield at 3.40% as of November 2, 2009 is amazingly low, especially in light of the fact that hard-core inflationists expected yields to do be soaring to 10% based on misconceptions about the CPI and/or money supply. Bear in mind the above table is a table of symptoms one would expect to see in deflation. A practical test of a good definition inflation and deflation is whether or not one would have predicted those symptoms based on their model of inflation and deflation. Those following money supply or the CPI certainly could not have reasonably expected a simultaneous massacre in both the stock market and treasury yields in conjunction with rising corporate bond yields. Those who could see and understand what a collapse in credit would do, had no such problems. Corporate bond yields have fallen since I wrote about Humpty Dumpty. And certainly the stock market has risen. However, underlying credit conditions have not improved. Marked-To-Market valuations have likely improved, but given the underlying fundamentals have not changed, I see no reason to change my model just yet. Credit (and credit problems) dwarf monetary concerns at the present. Until something happens to disrupt that model (far more likely from Congress than the Fed at this point) I see little reason to change my model. In fact, it will likely not be the model that changes, but rather changing conditions will give the model a different forecast. Right now, I still expect the US to slip in and out of deflation and recession for years to come just as happened in Japan. I also expect we will suffer through a Decade of Lost Jobs. Those focused on money supply alone, the CPI, the stock market, so-called leading indicators, or any other factors are likely to miss the boat unless their forecast just happens to be in alignment with credit conditions. Unfortunately, I cannot state a precise measurement of inflation or deflation given the shell games at the banks and the Fed regarding mark-to-market accounting. However, the hard data shows banks aren't lending, consumer credit is contracting, credit writeoffs are likely to exceed monetary printing, and symptoms like treasury yields are in generally in agreement. That to me is good enough. Given that credit conditions and bank lending have not changed and treasury yields are still near historic lows, fears over run away prices and soaring interest rates are misplaced. You can choose to call this environment "inflation" or "stagflation" if you want. No one can stop you. However, practically speaking, there is far more "stag" than "flation" and the proper prefix is still "de". The stage is set for another market crash. Taking his cue from David Hume and David Ricardo, Mises explained how the banking system was endowed with the singular ability to expand credit and with it the money supply, and how this was magnified by government intervention. Here We Are Again, Twice. To bail out the banks' poor bets on Dot-Com companies and Latin America in 2001-2002, Greenspan purposely ignited a credit bubble that led to the mother of all housing crashes. In response to the housing bust, the Fed refused to let failed banks go out of business and is attempting to force another credit bubble. However, banks aren't lending (except in China where a suggestion to lend is not taken lightly). All the Fed (central bankers in general) and Congress have done is create yet another asset bubble bailing out the wealthy. Meanwhile consumer debt still acts as a drag, unemployment is high and rising because sloshing money around at banks cannot possibly create any jobs (and it hasn't), and the pool of real savings that it does take to create jobs has been exhausted. Meanwhile taxes are soaring which puts still more pressure on job losses, foreclosures and defaults. Instead they follow unwise and disproved Keynesian and Monetarist tactics that have failed to accomplish anything but create bigger bubbles. However, this is the end of the line. Housing was the bubble of last resort, nothing can come close to the number of jobs created by the global housing bubble. Further attempts to reflate will do nothing but create a currency crisis, crash the economy, and add to future liabilities that cannot be paid back. A global economic crisis is coming. When and how it manifests itself is all that remains to be seen.